So when you write about vegetables and really want to make truffles, the selected sweetness for November's Sugar High Friday food blogging event (hosted by Johanna of the The Passionate Cook), what do you do? Get creative, that's what! 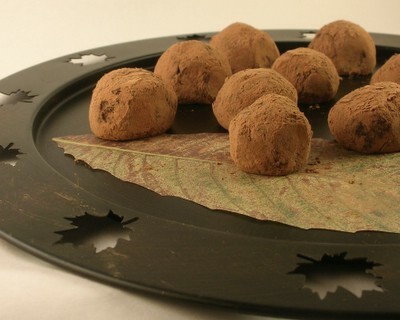 Enter pumpkin truffles! For anyone who craves a rush of buttery chocolate sweetness after a meal, these are a great choice. Each truffle counts as 1 Weight Watchers point and since they're small with fiber, can be considered 'low carb' with 10 NetCarbs. And with lots of chocolate richness, it's easy to nibble on just one, making it last. Much to my surprise, I found that eaten slowly, 'just one' was entirely satisfying. SOAP BOX MOMENT Was I surprised by one-point truffles? You bet. But it's the reason I am so disciplined about providing nutrition information and Weight Watchers points and NetCarb info. (Mostly, however, the surprises go the other direction, more points than expected in a harmless-looking recipe.) If you're a cook, you can calculate nutrition information for your own recipes too with a great product called Accuchef. Its Import Wizard makes it easy to import recipes, then it's easy to adjust quantities and add/subtract ingredients for illuminating what-if analysis. SO WHAT DO YOU THINK Do you buy this? Can a truffle fit into a weight loss and weight maintenance diet? Spoon puree onto a double layer of paper towels, spread evenly. Add a double layer of paper towels on top. Fold edges over the top side and the bottom side, pressing a bit to transfer excess liquid to the paper towels. Meanwhile, melt the chocolate and butter in a small saucepan. Let cool a bit. Stir in the liqueur and egg yolk, whisking continuously til smooth. Add almonds, powdered sugar and pumpkin; stir in until smooth. Cover loosely with plastic wrap and refrigerate. Roll into balls, then roll in cocoa. Refrigerate until ready to serve. Cool combination Alanna! Pumpkin Truffles sounds intriguing. those truffles look great! that program looks interesting...too bad it's only for windows users. now, i've got to find something like that for macs. thanks! These look delish and sound very intriguing. Leave it to you to combine veggies and chocolate. Hope you had a happy Thanksgiving! Excellent. The more WW stuff the better!!! Keep it coming. Meeta ~ Thanks! I see there were other (and more 'pumpkiny') truffles submitted too. Melissa ~ Let me know how they go! Kickpleat ~ Accuchef only works on Windows, boo hoo, thanks for the heads up. Pille ~ Tongue in cheek, Ms Pille?! Farmgirl ~ Hey, stranger! I'm still looking forward to 'coffee'! Peabody ~ Nobody took my WW bait, though. I was quite intrigued that they came out so few points. Surprising that these are Weight Watchers friendly... sounds too good to be true! They look great too! great idea, I take it ! In.ter.es.ting. Hm, that's a recipe I'll have to tuck away. I am new to scratch cooking. Can you tell me what liquer is used in this recipe? FiremansWife ~ Hmm, hard to say. I keep several in the liquor cabinet. First, it's liqueur -- so the sweet, kind of thick dessert wines you use maybe a drab at a time -- not 'liquor' such as vodka, rum, etc. Chances are, I used what would have been on hand, something to marry up well with chocolate - Gran Marnier, sherry perhaps, Frangelico, perhaps a maple liqueur from Canada. But if you don't have one of these, just use one that you have, or, even, use vanilla or almond extract. Good luck! Thank you, I will try this recipe. It looks wonderful!